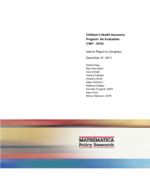 Submitted by: Mathematica Policy Research, Inc. This interim report is the first of two reports to Congress that will be developed as a part of the CHIP 10-state evaluation. It documents what is known about the CHIP program as of Federal fiscal year (FFY) 2010 and previews the issues to be examined in future evaluation activities and reported in a subsequent Report to Congress to be submitted in 2013. The main data source for this report is the CHIP Annual Reporting Template System (CARTS), a comprehensive reporting system established by the Centers for Medicare and Medicaid Services (CMS) for States to report on their CHIP programs. Data from the CHIP Statistical Enrollment Data System (SEDS) are also used for the analyses of enrollment in public coverage, and data from the Current Population Survey are used to document coverage trends from 1997 to 2010. In addition, published and unpublished literature on CHIP is used to provide motivation and context for the findings.